The first President of the bank should be a representative from India, the first Chairman of the Board of Directors – a representative from Brazil, and Chairman of the Board of Governors – a representative from Russia. Russia hopes that India will promptly submit its candidacy for President of the Development Bank, created by the BRICS countries (Brazil, Russia, India, China, South Africa), Deputy Finance Minister Sergei Storchak announced during a “round table” meeting, where they discussed Russian-Indian cooperation within the BRICS. “We are waiting for the government of India to make a proposal – as early as possible – for its candidacy to this post. We are looking forward to the candidate preparing, as soon as possible, a presentation of his position and his vision of the strategy for this institution and then visit founder countries with his strategy. After this, the formation process will begin of this organization as a financial institution, capable of tackling global challenges,” he said. Sergei Storchak was a member of a delegation, headed by Chairperson of the State Duma Sergei Naryshkin, which paid a two-day visit to India. 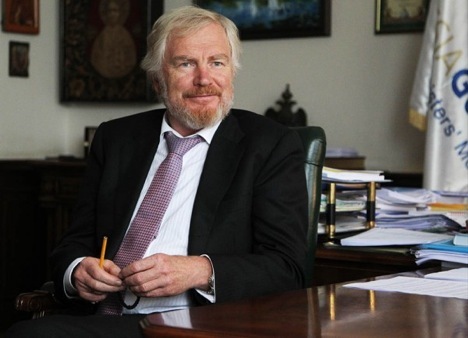 Storchak drew attention to the fact that during the negotiations on the formation of the Development Bank, the founder countries had agreed to a rotational presidency for this institution. “We have decided that the post of president would be held by one of the founders of this institution. As it was reported, the first president of this institution should be a representative from India,” he recalled. The Deputy Finance Minister of the Russian Federation stressed that great attention must be paid to the launch of the first project undertaken by the Development Bank. “We would like to announce it as early as possible, to make this a landmark project,” said Mr. Storchak. The agreement on the establishment of the bank was signed on July 15, 2014 in Fortaleza, Brazil. It provides for the establishment by the BRICS countries of a New Development Bank to finance infrastructure projects and sustainable development projects in the BRICS as well as developing countries. The founders of this bank were the governments of the BRICS countries, which enjoy special rights that no other members of the bank will have. In particular, the president of the organization will be elected only from one of the founder countries and on a rotational principle, with key decisions in the management bodies of the bank taken by a majority vote of the founder countries. There is a three-tier system of corporate governance in this organization – the Board of Governors, Board of Directors and the President. The first President of the bank should be a representative from India, the first Chairman of the Board of Directors – a representative from Brazil, and Chairman of the Board of Governors – a representative from Russia. As the Deputy Finance Minister Sergei Storchak earlier announced on the TV-channel Rossiya 24 (Russia 24), the first Chairman of the Board of Governors will be the Russian Minister of Finance Anton Siluanov. The volume of the bank’s assets has been set at $100 billion, of which dedicated capital is $50 billion, paid up capital – $10 billion (payable “on demand” – $40 billion). The payable capital will be formed within seven years. The capital is allocated proportionately among the bank’s shareholders. Russia’s share will amount to $2 billion. The Ministry of Finance of the Russian Federation has expectations that this Development Bank, created by the BRICS countries, will start operations already before year-end, while full capacity of this institution will be achieved in 4-5 years. This agreement is open for accession to new members – UN member states, including those from developing and developed countries. “It is very important that we make it clear from the outset, that this bank is open for membership to all interested states, and not just an institution for the BRICS countries,” the Deputy Finance Minister had emphasized in an earlier statement. The bank’s headquarters will be located in Shanghai, which is obliged to provide the office space and all necessary equipment for its operation.